“Oh, but I do have a job,” said I to little Abe. Of course I could have gone on and on about my duties in my job…. spiritual training… potty training… reading… speech therapist, chef gourmet!! !, maid, nurse, etc… Do I earn $ on this job – uhhh, no. So I can see why he wouldn’t think of me working at a job. But it made me think about how important my role is as mother. the masterpiece I longed to paint. for in my ever hopeful quest for a life fulfilled. 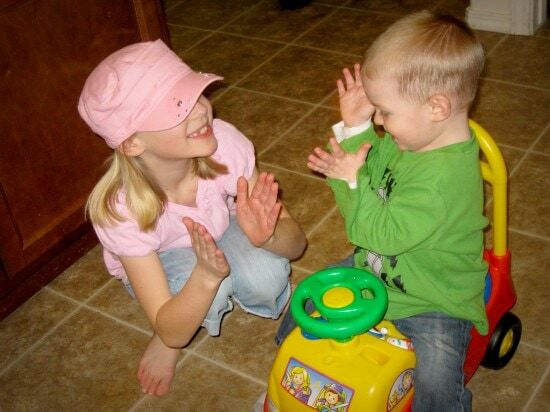 Those are the sweetest JOYS of mothering… the moments of PEACE and accomplishment. I was struck by the depth of strain and concern on this mother’s face… so real. 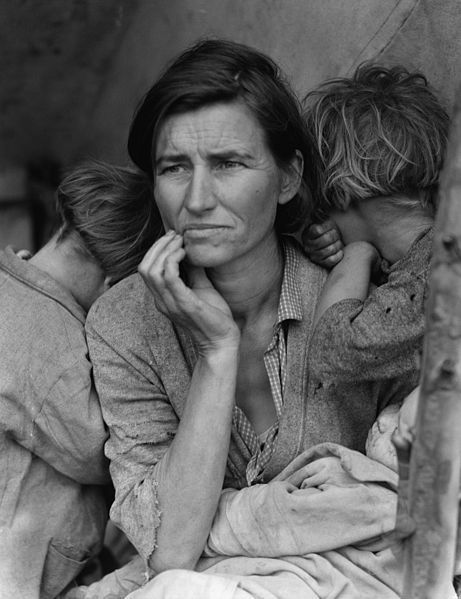 Migrant Mother – A Legend of the Strength of American Motherhood. 1930’s. Destitute pea pickers in California during the depression. Mother of seven children. Age thirty-two. Nipomo, California. This photo reminds me of all the strong women throughout time who have endured such hardships with faith and hope. 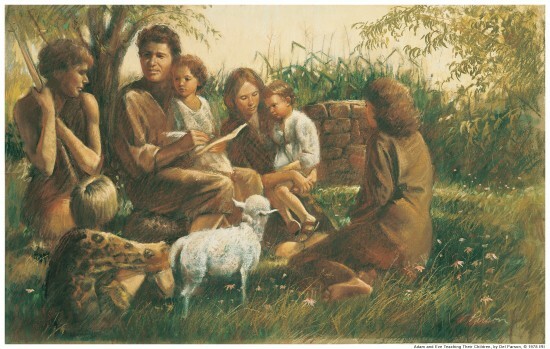 I specifically thought of the story President Uchtdorf told of his family’s escape to West Germany and how his mother went to find food at a train stop and couldn’t find the children for some time. I want to be a woman like her! Anyhoo… mostly random mothering thoughts. But I’m glad for my job. Glad for my tots. Glad I have a good husband to go on this journey with. Glad for a Heavenly Father who does not leave us alone in times of hardship. Glad He sends moments of PEACE and JOY along the way. The odds were completely against us (knowing that the Smiths have lots of boys in the extended fam. Jimmy has 9 boys and 3 girlies in his family. None of his siblings have more than one girl.) I kept feeling like our baby was a girl, but wondered if it was hopeful thinking. Hannah was completely elated at the news. 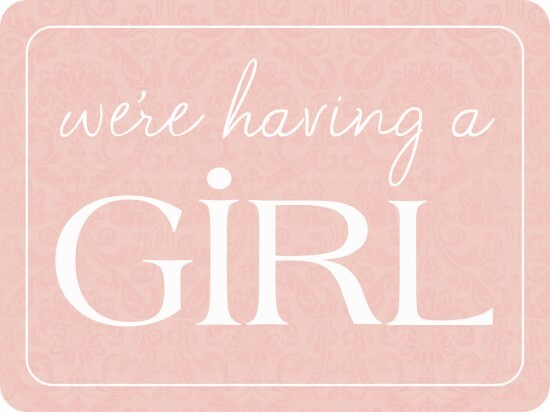 Her message to family, “We have some VERY exciting news… we’re having a GIRL!!”. The day I told her a little sister 9 years younger would look up to her and want to be just like her, Hannah got stars in her eyes and couldn’t stop smiling. Let’s hope she’s still smiling when she’s 16 and sharing a room with a 7 year old. Abe – not so excited. His message to family, “We are having a baby. Today we found out it is a girl. I am so mad. Ok, bye.” After I told him that I thought he would love our baby girl the most and help keep her safe and be a protective big brother, he seemed a little softened. Max is at a funny stage and will only call babies, “Babies”… they aren’t girls or boys… just “Babies.” We’re trying to convince him that the baby in mom’s tummy is a Girl Baby. We’ll see how that sits with him. Truman – eh – he’s clueless at this point. Jimmy – he said he was truly surprised. Grandma Smith said it was a MIRACLE. Grandma Price cried with JOY for all of us. As for me… I didn’t even cry (another miracle)… but I smiled… really big. 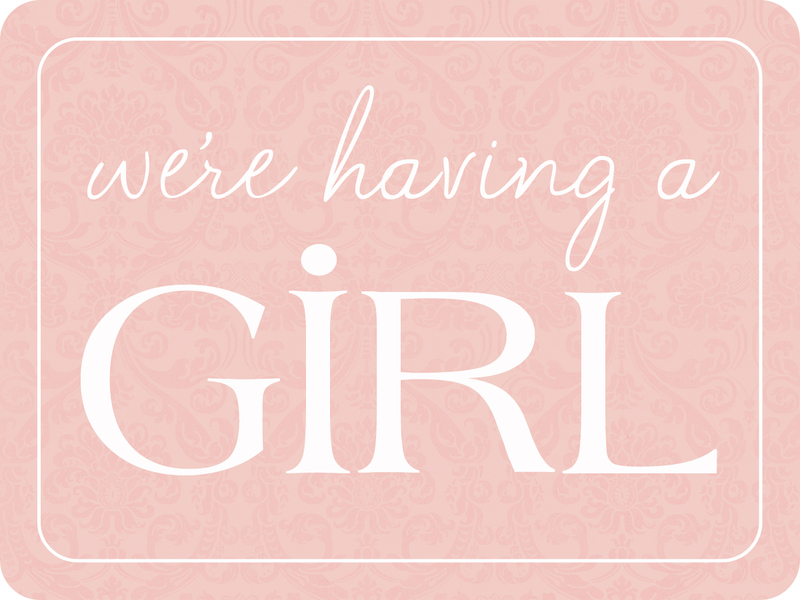 We’ll be excited to meet our newest family member in 18 weeks (wow – that sounds like a long time!). It’s a good thing I posted about JOY when I was feelin’ it this morning… for I didn’t exactly end the day full of JOY with the tots. 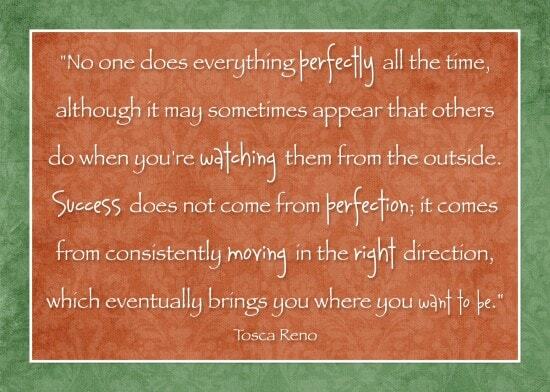 Sigh… Some days I think I’m moving backwards or am in stall. Some days I wonder if I even know what I’m doing as a mother. Satan is a booger to try to discourage mothers. Luckily I ran across this quote earlier this week. 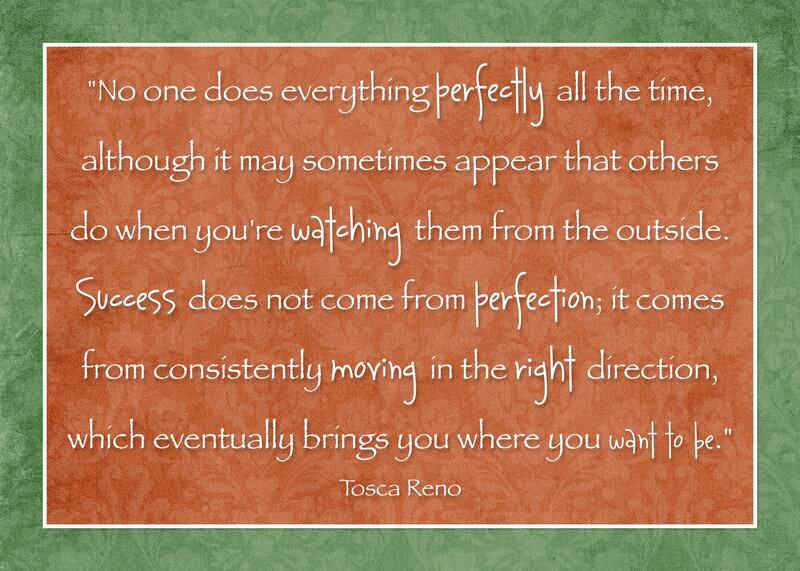 I like that it reminds me that my goal isn’t to be perfect at everything all the time… but to keep moving in the right direction and I’ll make it. I can’t make it by myself, I know. 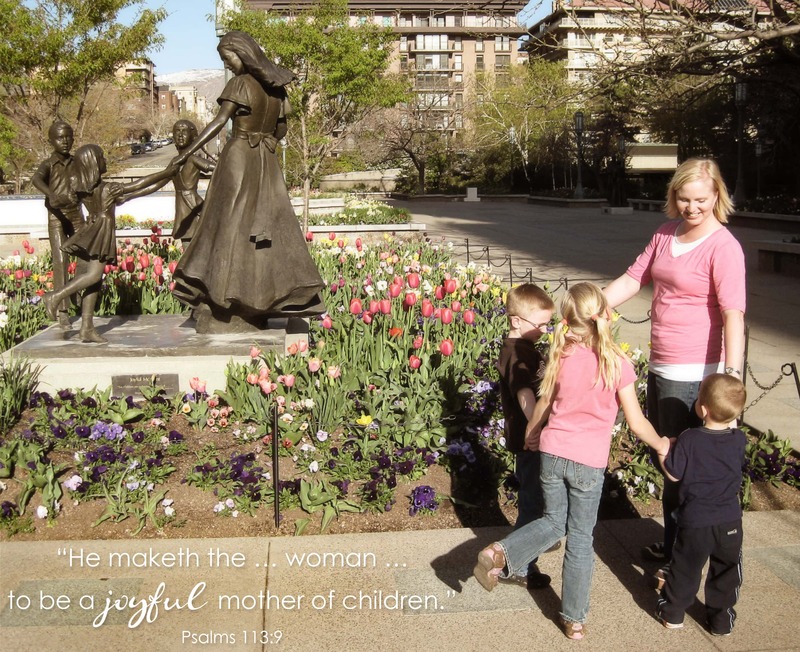 But with the Lord, my husband, and tots (may they please learn to obey the first time! ), we’ll keep trying to move forward on the right path. I came across this photo from April 2010. I never posted it because I kept hoping that I’d slim down and I could forget that I (once?) had chubs. Well… I’m still in the same state but with a rounder belly full of baby. But… I read once that it’s good to have photos of yourself with your kids no matter how much you dislike what you look like. Your kids will remember you as you were anyways. 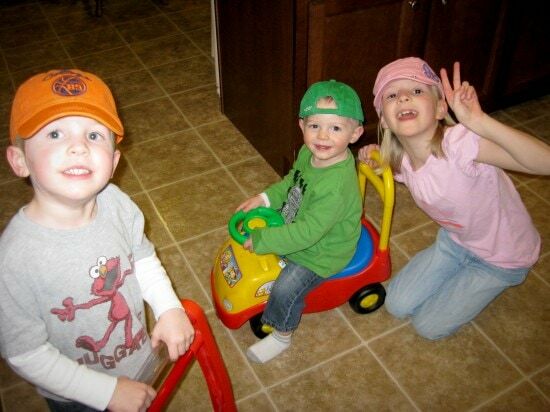 Anyhoo… this photo and memory made me smile. One thing I love about my life is that there is JOY sprinkled throughout. Sometimes I forget to see it. I’m too busy rushing through the day… or too frustrated about something with another tot. But when I take time to play with Tru, his laugh and smile remind me that JOY comes in moments. Snuggles and smiles and apologies from Max remind me that 3-year-olds have tender hearts too. Abe saying, “sooo… you’re not having the best day?” makes me laugh inside (even though I’m still outwardly frustrated at a situation). 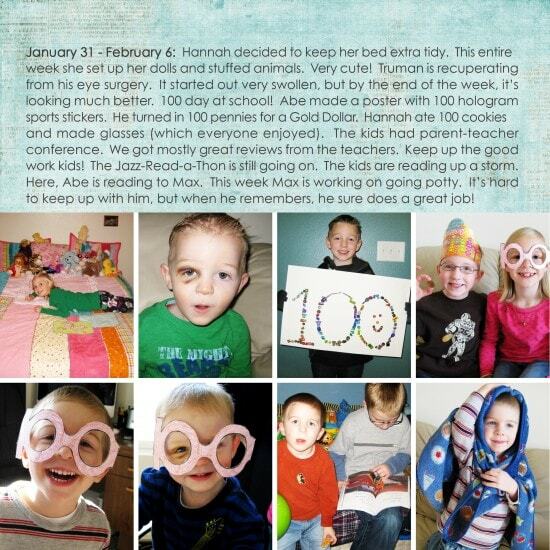 Hannah’s constant help and cheer bring JOY to us all. Walking into the house from errands with the laundry started and the smell of popcorn in the air reminds me that I am so blessed to have a helpful and willing husband. Being pregnant and mostly out of our normal routine for the past 2 months has been hard on everyone… but there has been some good come out of it. Instead of me trying to rush about getting stuff cleaned or working on the computer while the boys watched a movie or played, we spent time together playing in the playroom. We’ve read way more books than ever. We’ve built lots of tall, tall, tall towers and castles with legos. Yes, I was throwing cereal on the couch for Tru to snack on for breakfast, but overall… it has been good for me to slow down and just BE with my kids. The house isn’t as tidy and other chores go undone or get delayed, but I’m realizing that it’s more important right now to take time for my little ones. Perhaps this is part of what Heavenly Father needed me to do… He knows what we need more than we do, eh? He sends us life situations to teach us things that we are too stubborn to learn on our own. Hard to remember sometimes when I get frustrated that so many mothering/homemaking efforts go unnoticed or fail. But even though some days are really discouraging, I love when a SPRINKLE of JOY comes to me… and I actually recognize it. 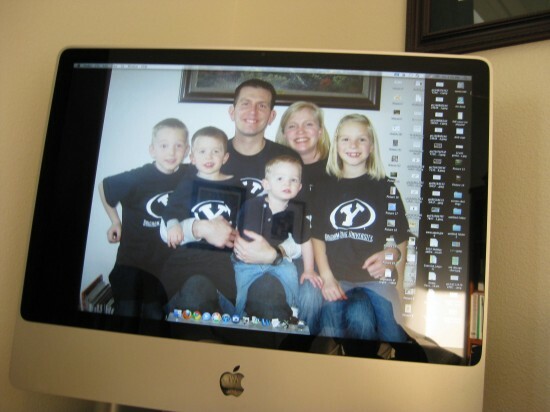 Anyhoo… I’m grateful that Heavenly Father sends JOY to this mother. I may not always act like a joyful mother, but my family brings me JOY. Even though I have crazy ups and many downs, I really can say that I love my beautiful, ordinary life… for I am blessed. https://www.jimmyandheather.com/wp-content/uploads/2013/10/200-x-100-logo.jpg 0 0 Heather https://www.jimmyandheather.com/wp-content/uploads/2013/10/200-x-100-logo.jpg Heather2011-03-30 07:59:542011-03-30 07:59:54"Joyful mother of Children"
what they could have had from you if they were only children. I read that quote a long time ago and have thought of it so many times when my older kids are such awesome helpers with the younger ones. Abe reads to Max. Hannah plays with Tru. I can’t be everything to everyone and it drives me crazy sometimes… especially when everyone needs me at the same time. But I’m so grateful that siblings can help mold, teach, and love each other. And perhaps in all the fights and screaming, they are learning to give and take … and will someday realize that being kind is best. Being part of a family is good. We all need each other, don’t we? Here’s the video of Max, Hannah, and Tru going bonkers after dinner. I was just glad Tru was being entertained by someone other than me. Other than the whiplash thing (which didn’t seem to bother Tru) … Hannah surely entertained these boys for a good 10 minutes. wrestle for 10 minutes with an arched-back Truman to get him dressed for the day. phew. task accomplished. max poops. nasty smell. sore bottom. time for a bath. not letting tru take a bath because i just wrestled his clothes on. decide that tru and i can sort the laundry in the bathroom while max soaks. tru reaches over to splash in the tub. splash… head first… with all clothes on. Tru had an ‘uh-oh’ look on his face. max still crying about Tru upsetting his bath. take Tru’s clothes off. wring clothes out. get max out because he won’t stop crying. realize max has a massive bloody nose all over his towel. just washed all the towels… and now more need to be bleached. tru is playing in the bath with no water. chilly, i’m sure. clothes on max. bloody nose stopped. wrestle for 5 minutes to get tru’s clothes on. get max settled on the couch with blankie and pillow to watch a movie. put tru down for night-night. only… tru is not sleeping. mom breaks and eats a chocolate chip cookie. so much for my 25 minutes of treadmill exercise this morning. p.s. my love, Jimmy, had the delightful experience of gathering groceries at Walmart on Saturday night. Generally he sticks to the list. But tonight, he came home with potato chips, oreos, twizzlers, and lots o’ hot chocolate packets. Mostly it was just funny because it’s not like him to do that. Tonight I might have come home with Milano’s if I was doing the shopping. p.s. 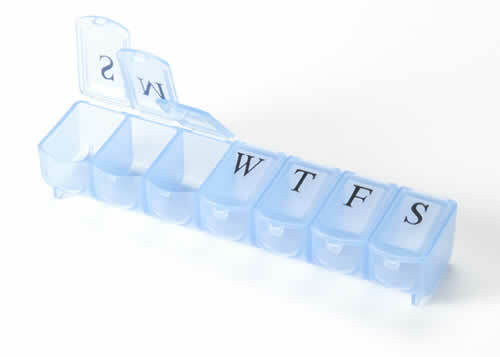 Do you think it means I’m old when I need one of these to keep track of medications and vitamins? I mean – I’m almost 35. I seriously can’t remember 5 minutes after I’ve taken something. 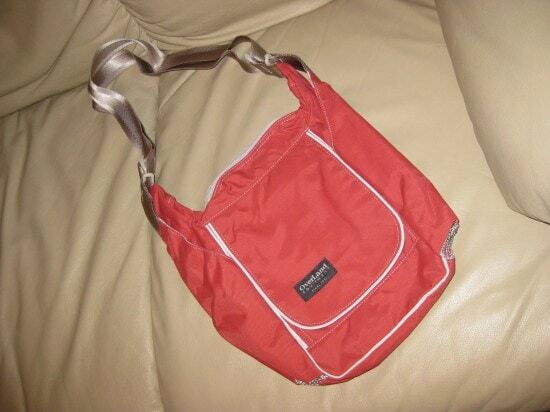 The one Jimmy bought for me (see above shopping trip)… was recommended by the arthritis society for easy open. Now I might actually remember to take all my vitamins. They should make these containers with alarms though too so I can take them on time. p.s. Tru and Max seemed to pull a Freaky-Friday swap on us this afternoon. Tru started climbing all over the place and going down the slide. And Max got a glassy look in his eye and laid down on the couch with his juice. I’m glad Tru is on the mend … and am hopeful that Max only has a slight cold instead of the croup that it sounds like. ay-ay-ay. p.s. the lights went out at the American Fork Temple today. Of course, nobody panicked. Work went on as usual. Love those smiley temple workers. Also… admire the courage of Adam and Eve. I highly doubt Eve was a whiney wife. Imagine going from living in the Garden of Eden… to the lone and dreary world… which I imagine would give any of us a fright. 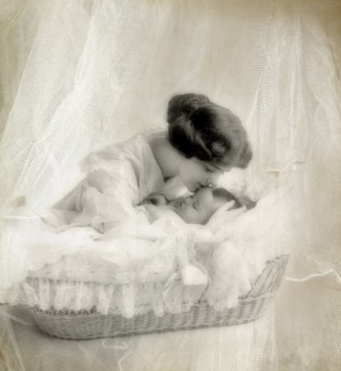 She was the first mother… and had to figure all that birthing and parenting stuff out without a mother to learn from. COURAGE! Love that example. p.s. we got barstools this week. yay! My friend moved and mentioned on her bloggie that their barstools were for sale. We snagged them quickly and got 3 nice sturdy ones for $60. I put the kids to work scrubbing them for Saturday Chores and they are really great. I only took a photo of the before… and I’m not posting the goobs on this blog. Excited about barstools! p.s. I guess Max got a hold of the camera this week. I just downloaded the images and I saw this one of our computer screen. I do like this photo of our fam. p.s. Hannah came home from school the other day with this hairdo that she had done herself. 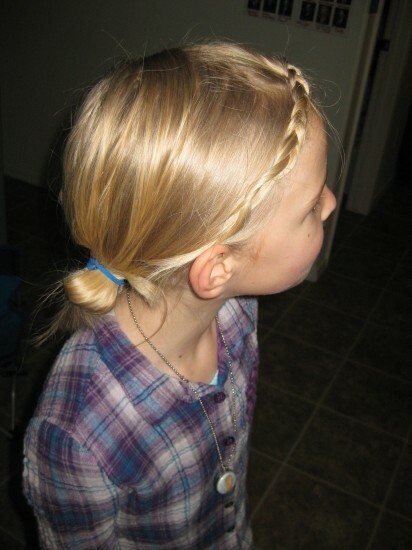 She looked like a cute little Scandinavian girlie. Remember how I asked for no more barfing… please? Except for one small incident with Max, we have been blessed with no more barfing. BUT… now that we have no more barfing here at home, poor little Tru-Tru is worse. His eyes are red and runny. His nose is red and runny. He wants to snuggle instead of run. The doctor told us today that wee little Tru has a wee bit of crackling in his lung = pneumonia. Add that to his major congestion and croup, he’s a pretty sick kiddo. Poor little Tru-Tru. He got an antibiotic shot for the pneumonia, a dose of steroid to help the croup, and a round of amoxicillin for the next 10 days. I’m SO glad for the inspiration to take him in today. He got a priesthood blessing tonight and he sighed. Pray for Tru. In other news: Max. This boy made me cry tears of JOY tonight. We were watching a movie and he was bouncing all over the couch behind us. He bounced over to me and gave me a big kiss on the cheek. Then he kept on bouncing. Even though he plants kisses frequently, this one really touched me. Then he sat on my lap and snuggled (a miracle for that energetic 3-year-old). Later, I was playing on the kitchen floor with him while dad made his hot chocolate. He is just plain happy. His smile glows. His laugh is so sincere and cute. When I tucked him into bed he requested a few songs. When we got to I Love to See the Temple, he sang along. It was sweet to me that though he hardly speaks full sentences, he can sing special little songs. Max is a JOY today. He is a little sunshine! Just yesterday I was thinking to myself (with a grateful heart) that we had been pretty lucky to avoid having lots of barfing sicknesses in our family over the past 8 years. Munch… crunch… I’m now eating my words. Shouldn’t have thought it… nope. Things swiftly change. Abe must have caught a flu bug yesterday at school. He came home just fine but after a few hours said his stomach hurt. I thought he was hungry and told him he could wait an hour for dinner. Well… he was for real sick. Oops. Poor boy. He tried to eat a bit of dinner but couldn’t. So Hannah helped him set up a bed upstairs (She’s a great little nurse). Right before bed… barfo. Gross! But – he made it in the bowl. Yay! Anyhoo… nobody wants to read a big long blah about barf. I’ll make a long night and story a bit shorter … Max and Abe were still under the weather this morning. Though Tru didn’t have the barfs he is going on a week with a green goobie nose. 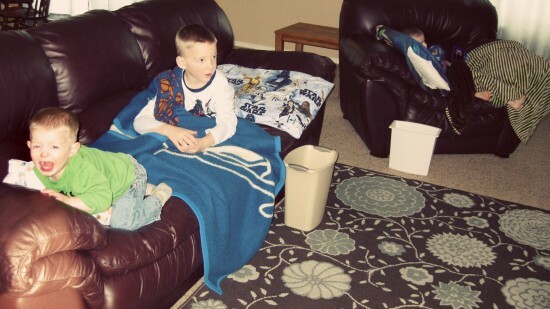 So… 3 little sickie boys…. what to do? I’ll just say it was a long day. I think it’s a 24-hour thing and hopefully Hannah won’t get it and we’ll be in the clear. Please! https://www.jimmyandheather.com/wp-content/uploads/2013/10/200-x-100-logo.jpg 0 0 Heather https://www.jimmyandheather.com/wp-content/uploads/2013/10/200-x-100-logo.jpg Heather2011-01-05 20:51:152011-01-28 14:10:56No more BARFing, please.